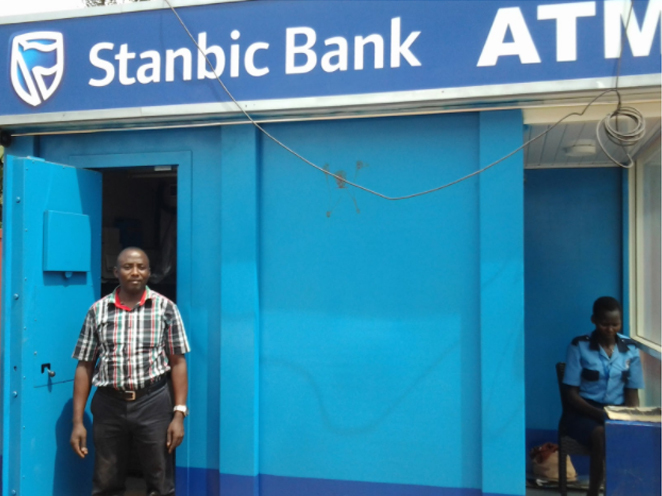 Stanbic Bank, together with AKCP’s representative in Uganda have implemented a monitoring solution for their Auto Bank ATM sites. Each site consists of an ATM machine, CCTV bases security system, the communication and network equipment and an airconditioning unit. The sites are running on AC line power, but during power outages a large UPS battery backup system is in place. 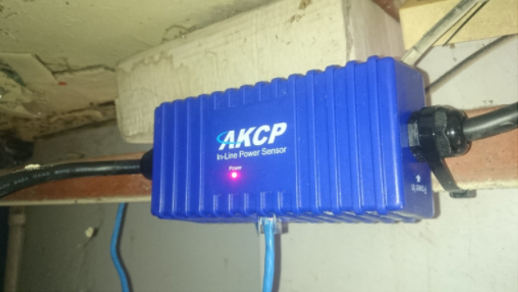 The solution deployed by AKCP was to use our SPX+ base unit to connect 2 in-line power meters with relays, a DC Voltage sensor and a dual temperature and humidity sensor. This system, also included a 3G cellular data modem for backup communications and SMS alerts. The system monitors the the power being consumed by the aircon, as well as ability to switch based on temperature. The second in-line power meter is used to monitor the power from the rest of the IT equipment. To monitor the UPS battery voltage, the isolated DC Digital Voltmeter was deployed. The diagram below illustrates the monitoring system deployed. 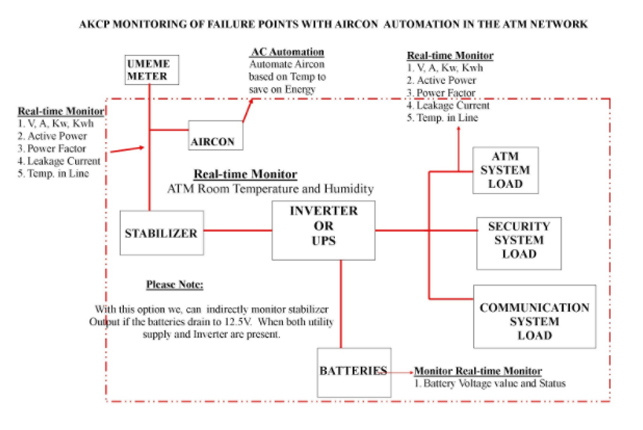 SNMP and Modbus virtual sensors were also used to monitor the ATM and inverter status, with all sites being monitored from the banks central office through AKCPro Server. The In-Line Power Meter connected to the ATM monitors the ATM energy usage as well as the stabilizer and inverter power output in relation to the battery voltage that is monitored using the isolated DC Voltmeter. The second In-Line Power Meter monitors both the utility (Umeme) power status and the air conditioning power input before the AVS, monitor the airconditioner power usage. The built in relay of the In-Line Power Meter automates the aircon based on the temperature readings from the dual temperature and humidity sensor. AKCP In-Line Power Meter installed under the floor below the ATM. This system ensures that the ATM is operating within its recommended temperature and humidity ranges, improving its up-time operations as well as prolonging the life of it and the aircon. In addition, there has been a 25% cost saving by the reduction of cooling, which contributes to the return on investment for the system. By installing this monitoring solution it has assisted Stanbic Bank in having a clear picture of their remote, offsite ATMs, saving technicians time troubleshooting, helping to pinpoint the failure points. All deployed devices are monitored centrally by using AKCPro Server. Stanbic Bank off-site ATM kiosk with Mugenyi Moses, AKCP dealer for Uganda.